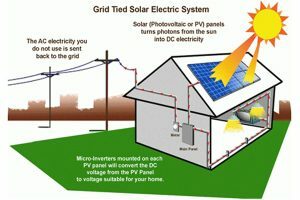 This is the most common question is this that how solar panel works. Well, solar panels capture the sun’s ultraviolet rays and generate DC current i.e. direct current before being converted to an AC (Alternating Current) in the solar inverter manufacturer. The output current from the inverter is just like power supplied by your utility company and can go directly to power all household appliances and lights. Excess electricity can be stored in a battery or fed back into the power grid. 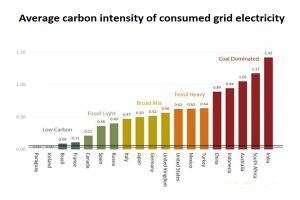 Additional electricity can be pulled from the grid if you need more power than your solar panels can generate. Solar panel consists of the appropriately named photovoltaic cells which converts sunlight i.e. photo in to electricity i.e. volt. 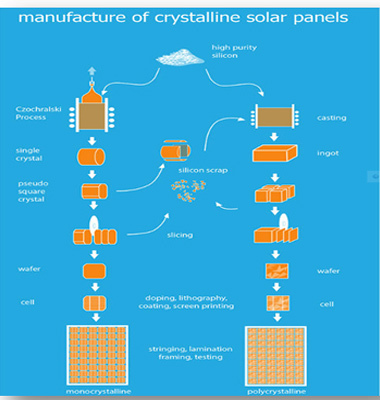 An array photovoltaic cells make up a solar panel. 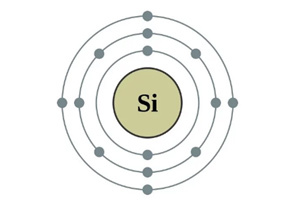 When a photon of sunlight knocks an electron free, the electric field will push that electron out of the silicon junction. Metal conductive plates on the sides of the cell collect the electrons and transfer them to wires. At that point, the electrons can flow like any other source of electricity. You can save approximately 50% on your electricity bills and this is the main reason why to go solar. Secondly, it’s a life time investment and beneficial for future generation. It is also nice to the environment. Renewable source of energy and sustainable. Solar is inexpensive and practical option. Actually sun is the big battery for us so save polar GO SOLAR. What Are the Types of Solar Panels? We are considered among one of the largest manufacturer, supplier and exporter of quality solar panel systems. The reason behind this is our adherence to the quality of the product and use of top line technology. We as a solar panel system manufacturer, supplier and exporter provide in a variety of sizes and power, making them suitable for small scale to large scale power application requirement. Our provided solar panels system works in all type of weather situations because of its quality. If you want to power up your house with solar photovoltaic system than your decision making process will include choosing a right type of solar panel. There are mainly three types of solar panel that is monocrystalline, polycrystalline and thin film. However they have the same objective to convert solar energy to electricity. They just differ in cost, efficiency and its performance. We provide solar panels in two different types that is mono solar panel and poly solar panel, both are know in the market for its highest precision engineering and promised output, can be used for the residential applications as well as industrial applications.